Cleantech Invest today announces the results of its first impact analysis. Cleantech Invest has analysed the overall effect of how its portfolio companies are improving the earths ecosystems. Traditionally big corporations have measured their ecological footprint i.e. how much (or little) they pollute in their own operations. In the fresh analysis, Cleantech Invest has instead focused on its ecological handprint i.e. how much greenhouse gas emissions and water use are reduced in the world, by end customers using the products. The companies selected for this first analysis were Swap.com, Sofi Filtration, Nuuka, Enersize, ResQ and Eagle Filters. The first-year analysis is looking at carbon emissions and water use, but will during the coming year include more parameters. Cleantech Invest carbon impact for 2016 was minus 158 000 tons of CO2 equivalent, which corresponds to taking 107 000 cars in Finland off the road for a year, or the annual per capita carbon emissions of 17 000 Swedish households. 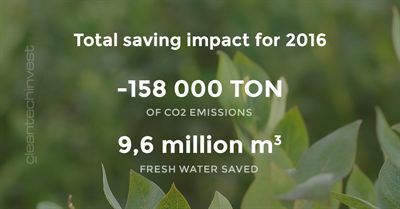 The total water impact was calculated using data from two firms, Swap.com and Sofi Filtration, and resulted in 9,6 million m3 freshwater savings, which corresponds to the annual household water use of 164 000 Swedes or 3840 Olympic-sized swimming pools. The interest from investors to understand the carbon impact of their investments has increased drastically over the last few years and it is only gaining in momentum. Endowment funds, pension funds and entire countries are announcing divestments from carbon-intensive industries. Cleantech Invest has taken the task of more detailed impact measurement starting this year, so that investors and potential shareholders can better understand the effect their investment in the Cleantech Invest share is having on the environment. The impact numbers are based on actual savings in carbon emissions and fresh water use during 2016 due to the sale of products and services by the companies included in the analysis. Carbon emissions of each company as well as Cleantech Invest has been estimated and deducted from the total savings. Full details of Cleantech Invest’s impact can be found at http://www.cleantechinvest.com/impact-eng where you can also calculate the impact of your shares in Cleantech Invest.